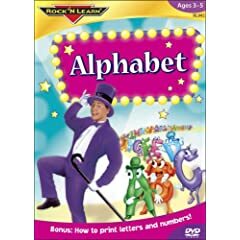 Even 2 year olds can learn the alphabet from these items! This is a very good DVD. 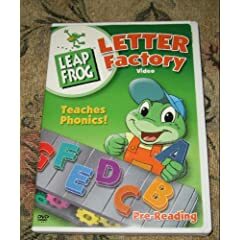 Through music and adventures, the frogs teach your child the sound that goes with each letter of the alphabet. Designed for children ages 2 to 5. Currently this is the 101st most popular DVD on Amazon. This caterpillar has a letter on each leg. It has several modes. If you pick the letter mode, when you press a leg it says the name of the letter. If you pick the phonic mode, when you press a leg it says the sound of the letter. If will also sing the alphabet song. I received it as a gift when my child was 18 months ago. It's a great educational toy. This video uses Rock Music.